Do you know what to ask potential solar power installers before you hire them to complete your solar project? In this blog series, we’re sharing 38 questions to ask solar companies before you hire them to design, install, and maintain your solar power system. In part one, we shared questions you can ask companies about potential cost savings, required licenses, and expected insurance coverage. In this post, we’ll offer more questions to ask companies about their reputation, potential maintenance obligations, and warranties. If you’re ready to hire a solar power installer now, give West Coast Solar call today! We’ve been serving the San Jose and Sacramento areas for years. We’re a solar company dedicated to the future of renewable energy use and consumption by homeowners and business owners in California. Otherwise, continue reading this post to discover more questions to ask solar companies! It can take some time to find the best solar power installer for your project. However, when you do your due diligence, you get the perfect installer. One way to do this is to collect information on their reputation with customers and in the industry. How big is the area you service? How many solar power systems have you installed in the last 12 months? How much experience do you have working with my utility company? How do you handle the permitting process? Can you provide customer references to call? You’re about to add another feature to your home. Like your yard or vehicle, you need to know what is expected to keep it maintained and functioning properly. A solar power system is no different. Know what it takes to sustain optimal performance before you buy. How often do I need to maintain my solar system? Who do I call if something goes wrong with my system? How long will it take for someone to come fix my system, if needed? What happens if the solar power system does not produce as much energy as promised? If my roof needs repair, how will the solar panels and system be removed to do so? How is your system covered in case of failure or damage? If your system fails or sustains damage, you need to know what you’re financially responsible for and what your warranty will cover. You don’t want to end up with a broken solar power system on your roof and no way to fix it. What warranties do you offer for solar power design, installation, and maintenance? Who do I contact if I need to file a claim? What are the different warranties for the components of my system? What do the warranties cover, and what do I need to expect to be responsible for? Do the warranties cover components, installation, labor, and more? Do the warranties cover the roof? 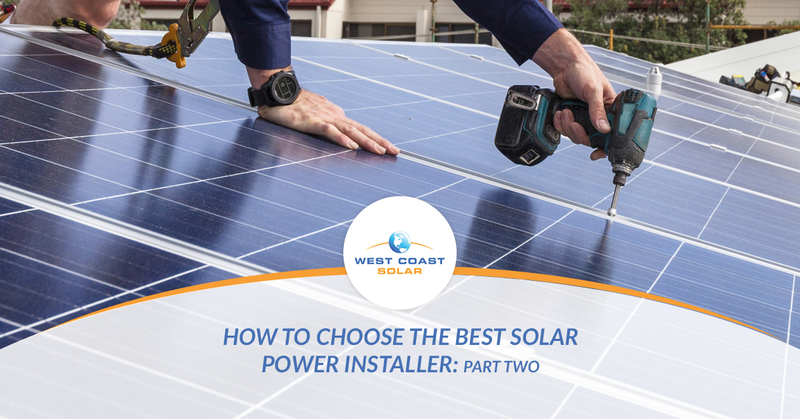 Choose West Coast Solar as your solar power installer! After years of serving San Jose, Sacramento, and the surrounding areas with solar power installation, we understand what it takes to get a positive return on your solar investment. With various financial benefits like the Solar Investment Tax Credit and special financing, you can save money on your utility bills, reduce carbon emissions, and create a better future for your family. In part three, you will discover 14 more questions to ask potential solar companies. Ready to make the switch to solar power? Give us a call today!